NFL survivor pools — football contests in which you have to pick one team per week, and you lose if your pick loses — are the most complex football pools from a strategy perspective. The added constraint that you can only pick a team once per season makes figuring out your best weekly pick an incredibly challenging process. If you think that winning an NFL survivor or knockout pool simply involves picking the most likely team to win, then you are exactly the type of player that true survivor pros want in their pool. You are the bait, they are the sharks, and you don’t stand a chance against them in the long run. In this post, we’re going to quickly review the foundations of winning survivor pool strategy. 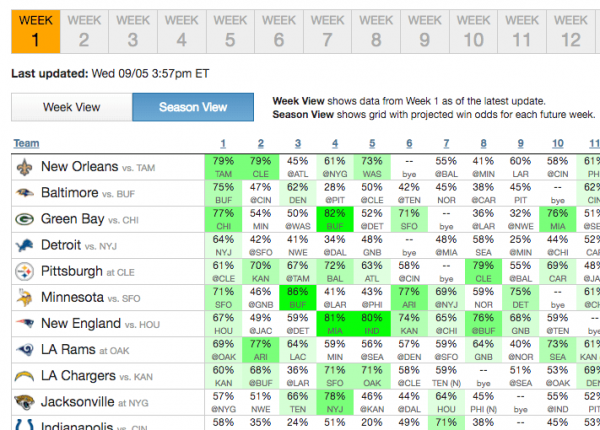 Then, we’ll analyze five Week 1 survivor picks you’re probably considering. Players who don’t understand optimal survivor pick strategy only think about maximizing their chance to survive the current week. That’s a rookie move. Sharp survivor players understand that in order to have the best chance to win a survivor or last man standing pool, you can’t always just pick the safest team. The goal of an NFL survivor pool is not to stay alive for a certain number of weeks; the goal is to stay alive exactly one week longer than all of your opponents. Those are two very different objectives as far as optimal pick strategy is concerned. However, you need to be ready to seize these contrarian opportunities whenever they present themselves. A great one might not come along until Week 10 — or it may come in Week 2. Psychologically, it’s very difficult to make even slightly riskier picks in the opening weeks of a survivor pool. But if you’re too timid to make a calculated gamble early on, then you won’t have the best chance to win your pool. Now let’s get to some Week 1 survivor pick analysis. Here are some important details you need to consider about the five most popular survivor picks of Week 1. No surprise here — the most likely team to win in Week 1 is also the most popular survivor pool pick. New Orleans, coming off a big improvement of a season in 2017, is a 9.5-point home favorite against a Tampa Bay team missing QB Jameis Winston. The Saints also shredded the Bucs 30-10 in the Superdome last year. The public has taken notice, and piled on to New Orleans to the tune of 30% pick popularity. That means the Saints are almost twice as popular a pick as any other team in Week 1, despite several other teams being almost as likely to win. Tack on a top-6 future value ranking for New Orleans (Week 5 in particular looks like a good spot for them) and the Saints are certainly not an “obvious” play this week for sharp players. As 7.5-point favorites at home, the Ravens are our third most likely winner of Week 1, as they take on a Bills team helmed by unproven second-year QB Nathan Peterman. That’s a modest, but not insignificant step down from the Saints in terms of survival odds. However, it does come with positive tradeoffs. Baltimore is a popular pick this week (18% pick popularity), but not excessively so, and the Ravens’ early/midseason schedule features a lot of tough matchups with the possible exception of hosting Denver in Week 3. Especially if you’re in a smaller NFL survivor pool, your pool may be over before Baltimore would next make sense as a top pick consideration. That won’t be the case with bigger pools, though. Fresh off a contract extension, QB Aaron Rodgers and company face off against a Bears team hoping for a resurgence in 2018, especially after adding elite linebacker Khalil Mack via a last-minute trade with Oakland. Both the Vegas line (-7.5, same as Baltimore) and our models have Green Bay as the second most likely team to win this week, though our models are slightly more optimistic. The big positive here is that the Packers are the least popular pick (15% popularity) of the three teams favored by more than a touchdown in Week 1. Part of that may be the result of the public’s fear of picking a divisional rivalry game, based on the irrational belief that these games are somehow “less predictable” than non-division games. That’s a bias to exploit, but burning Green Bay also comes with a cost. The Packers are currently No. 9 in our future value rankings, projected to have five future games with 70% or better win odds. Burn them in Week 1, and you lose those options. This matchup features rookie Lions head coach Matt Patricia vs. rookie Jets QB Sam Darnold, with Detroit favored by 6.5 points at home. The Lions are coming off a 9-7 campaign and solid season from QB Matthew Stafford, and according to Vegas lines are the fourth safest pick of the week (though it’s worth noting that our models disagree). The best feature of Detroit as a survivor pick this week is low future value. We project the Lions will be a below-average team in 2018, and the number of future weeks in which they’ll warrant even minimal consideration as a survivor pick look pretty sparse. That said, at 10% pick popularity, Detroit isn’t much less popular than Baltimore or Green Bay this week, and they are a riskier pick. For the last two seasons, picking against Cleveland has been as close to a foolproof survivor pick strategy as a player could hope for. The Browns have managed just one win in their last 32 games, so it’s a bit surprising not to see more picks piling on Pittsburgh this week; at post time the Steelers’ pick popularity was about 8%. At least to some degree, the public seems to recognize that this is a road game for Pittsburgh, and that additions such as QB Tyrod Taylor and WR Jarvis Landry have improved the Browns’ prospects in 2018. Plus, the “divisional game fear” is likely having an impact as well. Still, the big question here is whether 8% pick popularity is even warranted. Burning a team like the Steelers, who are expected to be very good this year, as just a 4-point Vegas favorite on the road, when you have 31 other teams in your quiver to choose from? That’s a tough pill to swallow, even if it does mean you get to pick against the Browns. Your best NFL Week 1 survivor pick is the one that offers the best balance of safety, pick popularity, and future value for your specific pool. Every possible pick has an expected value associated with it, and it takes a lot of data and math to figure out which is the highest. Why? Because factors like the size of your pool and its specific rules can make a big impact on your optimal picking strategy, even in Week 1. For example, the more entries your pool has, the more aggressive your picks need to be. In very large pools, you know going in that you’ll probably need to survive all 17 weeks to have any shot at prize money, so if there’s a decent option to pick a mediocre team early on, you should probably take it. In smaller pools, though, you’d want to play it safer. It’s never easy to win a survivor pool, and even with the edge our product gives, you’re not going to win much more often than you do win. But in the long term, our subscribers are winning pools 2-3 times as often as expected, and that performance typically translates into fantastic financial returns. We invite you to give all our NFL picks and tools a try for free for NFL Week 1: NFL Survivor Picks, Football Pick’em Picks, and NFL Betting Picks.